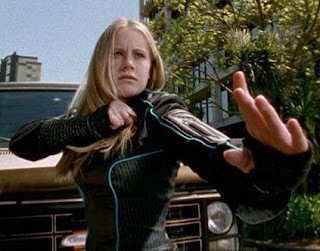 Sally Erana Martin is an actress best known for her role as Tori Hanson/the Blue Wind Ninja Ranger, who has the Power of Water on the television series Power Rangers: Ninja Storm. Martin became very famous after doing the Power Rangers series. Besides her role in Power Rangers: Ninja Storm, she has also worked in several other shows such as The Tribe and The Strip and in the TV movie Murder in Greenwich.